Debuting on Friday, July 21, Swing Set is the follow-up to Jazzy Ash’s fantastic album, Bon Voyage (2015). 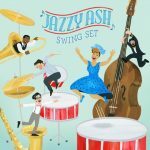 Each track on Swing Set is at least 90 years old and found a place on the album after years of research by Jazzy Ash regarding early recordings and songbooks of African-American music. With her new arrangements for a modern generation, the songs and rhymes on this album will be enjoyed by children of all ages. Premiering today is “Eh La Bas,” the debut single from Swing Set. A traditional New Orleans song that was originally sung in Creole, it was later translated into French, and is performed here with additional verses in English. 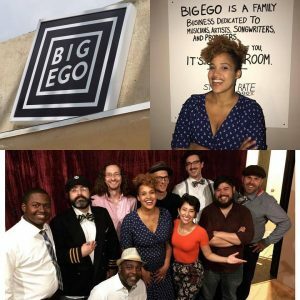 The video is shot in the recording studio which gives a fun mini-behind-the-scenes look at how a song is recorded, while capturing all the joy of Jazzy Ash and the musicians as they perform the tune. A choir of children is also in the studio and provides a depth to the call and response chorus. Beware, “Eh La Bas” is infectious and may cause spontaneous sing-a-longs to occur. A great kick-off to a fantastic album! Enjoy! !